I first made these tasty cookies with a Greek friend. 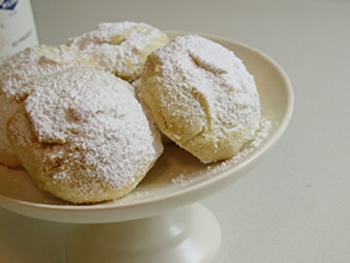 They are one of the easiest of all cookies to make and are light fabulous puffs of almond as the melt in your mouth. Some call them Sugared Almond Cookies. No matter what you call them they're a tasty treat your whole family will enjoy! Cream butter and sugar. Mix in flour, ground almonds and vanilla. Mix well. Roll into 1/4" balls. Roll in powdered sugar. Place on ungreased cookie sheet. Bake for 35 minutes. Cool cookies. When cool roll cookies in sugar again. My notes say to double this recipe as it doesn't make a lot.